It has the face of a bunny, teeth of a bunny but has horns instead of bunny ears and a bit of scales like a fish. It is a mythological creature and there is water surrounding it. Beauty and mystery. 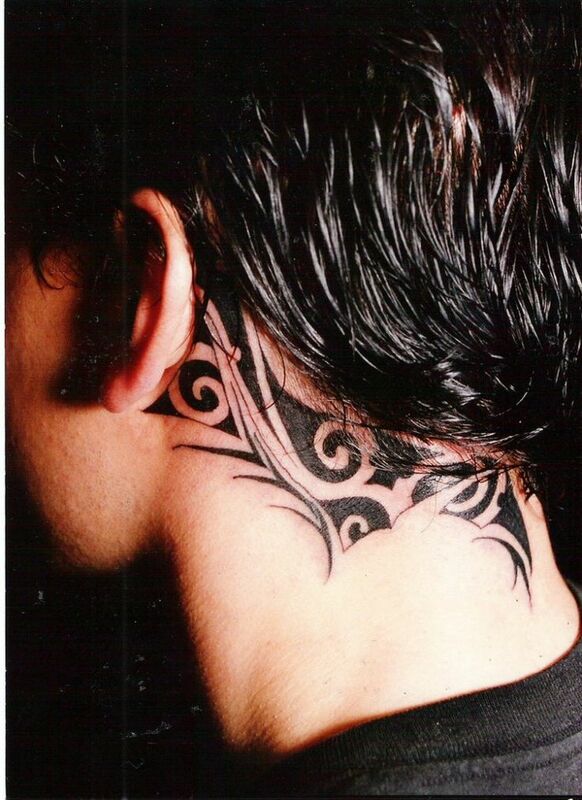 These are common tribal tattoos. They originate from tribes that tattoo their worriers in the Amazon as well as in parts of Australia and New Zealand. They are also common in pop culture especially rock and heavy metal fans. The magicians hand with fire at the tip of his two fingers. This is a tattoo suited for people who believe in magic or perform magic tricks. It is cool and exciting. Gets people’s attentions and starts conversations. beautiful art. 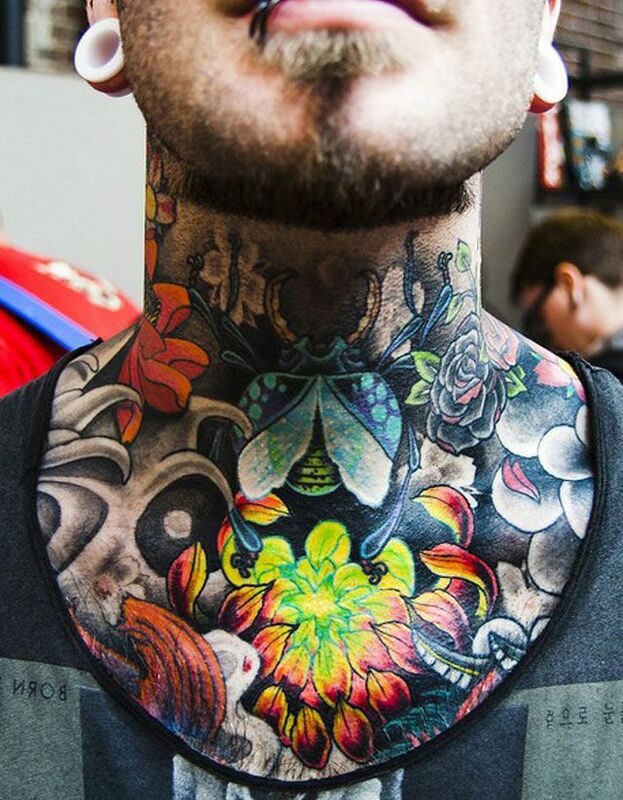 This tattoo turns the entire neck into a work of art. 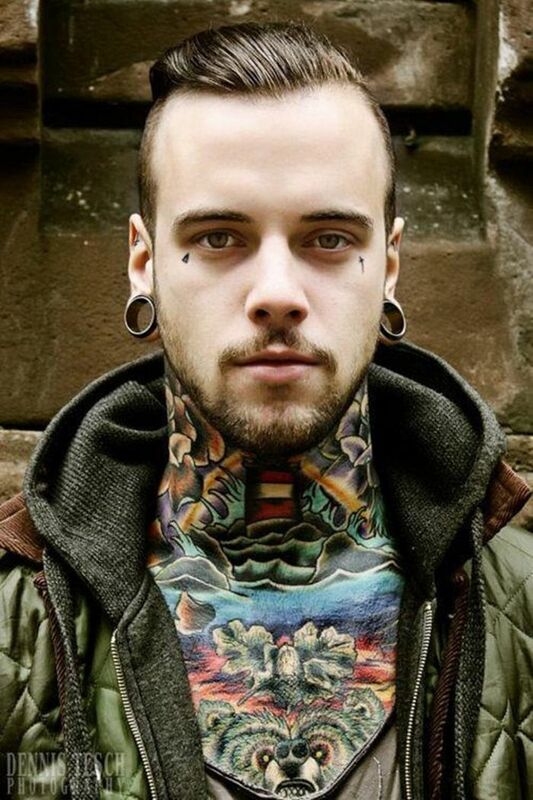 There are a lot of tattoos fused into one like a mural. It is a combination of different colours with different flowers and a ladybird. It is intriguing. The grey owl tattoo is a mixture of self-expression and art. The tattoo looks almost life like. It is as though the owl is trying to intimidate another animal. 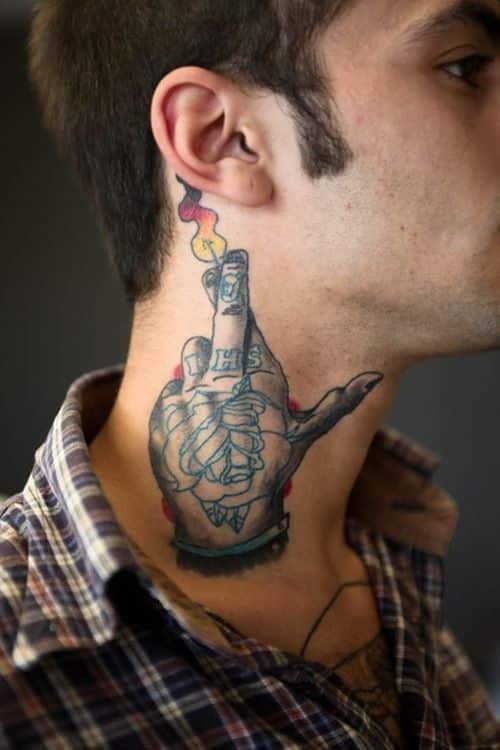 It can depict the personality of the owner of the tattoo. 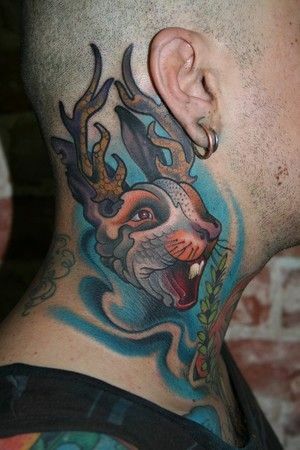 It is part of a complete body tattoo that extends beyond the entire neck going down to the chest and lower. This tattoo turns the entire body into an artist’s canvas with a beautiful piece of art. The skull inside a rose is a depiction of beauty and misery combined. It can be used to express the person’s character as being beautiful but deadly or the person’s experience in life that has both good and bad moments. 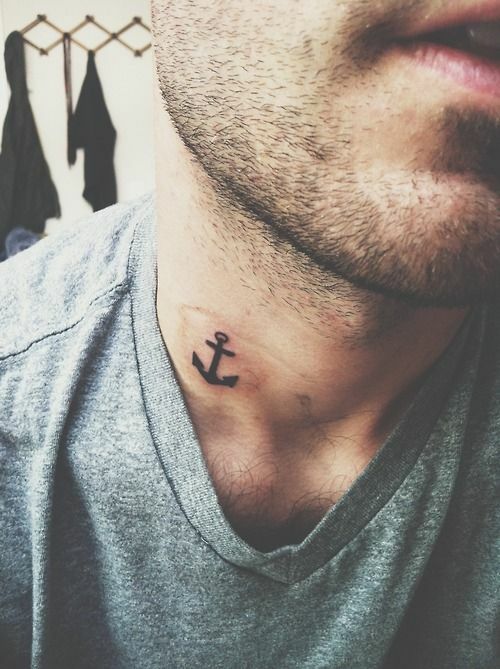 The small anchor on the neck is usually associated with sailors or soldiers. In the past, it was common among pirates who liked to express their love for the sea. It can also symbolise a firm grip on life. 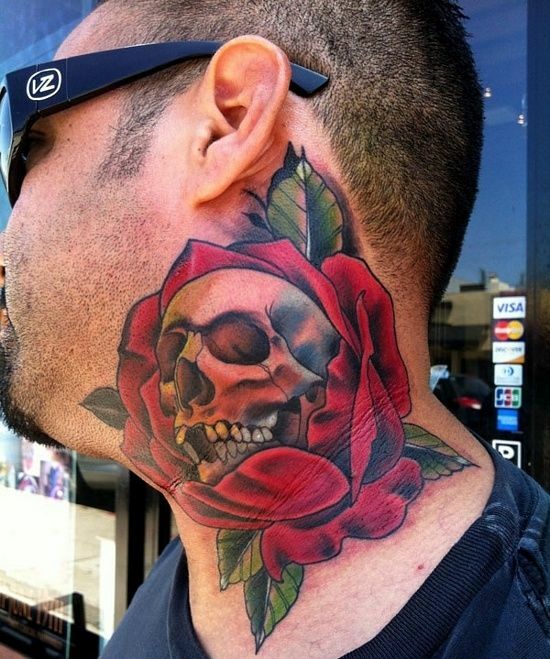 The red rose at the front base of the neck and the leaves creeping up the sides of the neck. It is an artistic tattoo that incorporates tribal markings to make up the leaves of the flower. It can be used to depict the personality of the wearer. The owl seems to be emerging from the shoulders. 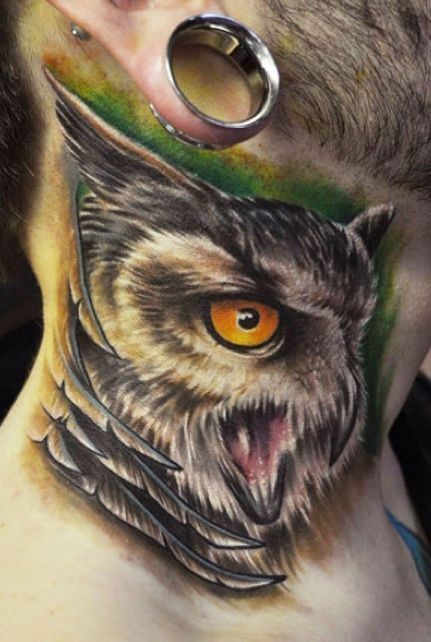 The eyes of the owl are the centrepiece of the tattoo. 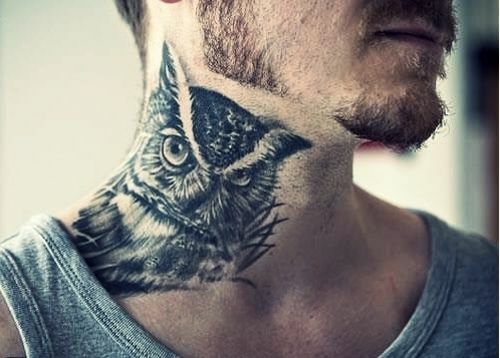 Owls are known to be watchful and intelligent so this tattoo brings out that quality of the person wearing the tattoo.